Publishes the current module's artifacts and the resolved descriptor (delivered ivy file). 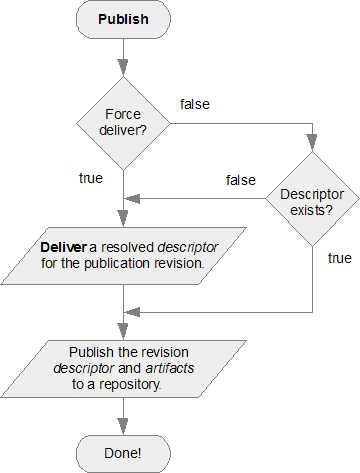 This task is meant to publish the current module descriptor together with its declared publication artifacts to a repository. All the artifacts must have been created before calling this task. It does not create the artifacts themselves, but expects to find them at the location indicated by the artifacts pattern. The target repository is given through the name of a resolver declared in current ivy settings. See Settings Files for details about resolver supporting artifact publishing. since 1.4.1 The source artifact pattern can be specified either as an attribute on the task (artifactspattern) or using a list of nested artifacts element (see examples below). Publishes the last resolved module in the local resolver with revision 1.0, looking for artifacts in directories 1 and 2.